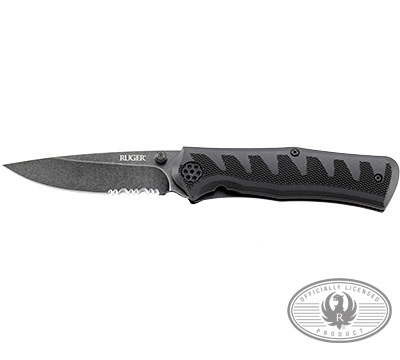 Ken Steigerwalt Designed: Folding knife with locking liner - featuring Outburst® assisted-opening; reliable Fire Safe® blade safety; stonewashed, drop-point 3.50" blade; Ruger American Rifle®-inspired, glass-reinforced Nylon handles; and a clip. Made from 8Cr13MoV Hardness 58-59 HRC Steel. ShopRuger Exclusive. KNIFE PURCHASERS: Knife purchasers must be at least 18 years of age and be able to legally purchase and own the knife (or knives) being purchased in the jurisdiction in which they reside. Purchasers should be aware that federal, state, county and municipal laws may restrict the purchase, possession and use of knives based on their various characteristics, including but not limited to the knife's configuration, blade shape, blade length and the type of opening mechanism. STURM, RUGER & COMPANY, INC. SPECIFICALLY DISCLAIMS ANY WARRANTY THAT KNIVES IT OFFERS FOR SALE MAY LAWFULLY BE PURCHASED, POSSESSED OR USED IN ANY PARTICULAR LOCALE. IT IS THE RESPONSIBILITY OF PURCHASER TO DETERMINE WHETHER HE/SHE MAY LEGALLY PURCHASE, POSSESS AND USE ANY PARTICULAR KNIFE UNDER THE LAWS OF HIS/HER LOCALE. By submitting an order for a knife, purchaser certifies that: he/she is at least 18 years of age: the knife being ordered may legally be purchased, possessed and used in purchaser's locale; purchaser intends to use such knife for lawful purposes; and purchaser assumes all risk of injury associated with the ownership, possession and use of the knife, including the risk of personal injury or death caused by misuse or careless use. This product is not available to be shipped into New York State.